The chocolate croissants we made were to die for! I think the weeks are going by quicker, or is that just me? I felt like I kept meaning to write a post this week and then it all of a sudden was Friday. I’ve been working a lot lately, which is good and bad. It takes away time from the blog since I’m often a little too tired in the evenings or inspired to write. This week has been pretty hectic too since we are cat sitting our friend’s kitten, he is a handful! But in all the best ways. His name is Finnigan and he is so cute and cuddly when he wants to be but also a menace when he wants to be, such a cat. Dave loves cats and he really wants a kitten, but he also wants a puppy at the same time. A little too much for our small space right now. So it will definitely be something that will have to wait until we have a bigger space. But for now we have a pseudo kitty and it’s nice to come home to a pet who’s excited to see you after a long week! The ridiculous amount of butter that goes into the croissants! I couldn’t be happier for the weekend, even though it’s half way over now! I have some plans in place but not too many. I signed up for a half marathon at the end of October so now I have the motivation to get back into distance running. The weather is supposed to be nice today so I am hoping to manage at least a 12km run, fingers crossed! Yesterday, I did a mozzarella making course, which was really interesting! I’ve never made cheese before and I love mozzarella so now that I know how I definitely plan to recreate it at home, so stay tuned! Today post run and errands will be making some loaves of sourdough but most importantly we are going to make hot cross buns, something I love especially at this time of year. Easter is next weekend and I can’t wait, I love Easter but mostly I love chocolate and I can’t wait to eat it again! I won’t bother writing the recipe out here as it has numerous steps that are very important to follow. 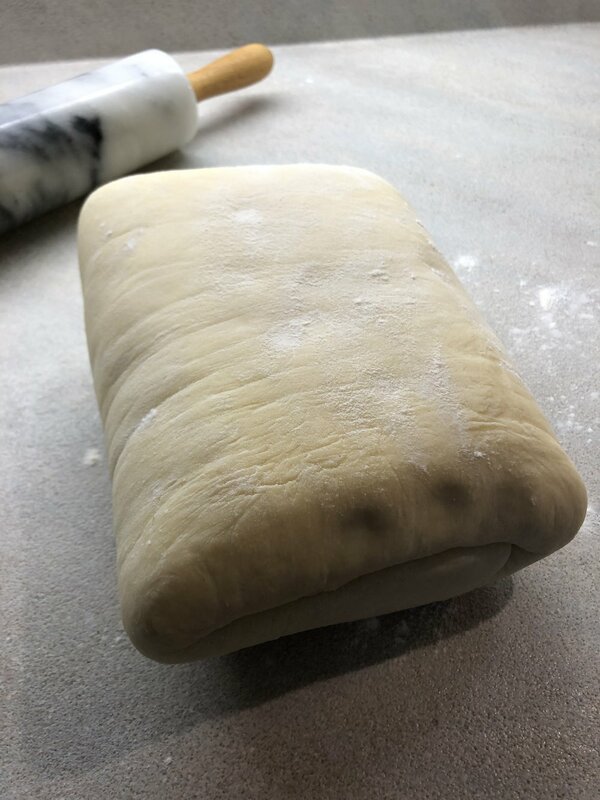 I did want to share with you that I have been afraid of making pastry and bread for a long time. I have always been an avid baker and now it is my profession. However, there are still some things I make that can be very intimidating. Until I started working at the cafe I was afraid of making pie crust and now I make a quiche every Thursday and Friday and it is actually really simple. So if croissants are something that intimidates you like it did me, make them with someone else. Dave is a very precise baker and is very good at following directions so we worked on them together. I watched a lot of the time but I feel like I could make them on my own now and am excited to keep working with pastry. Next big pastry project is Pain au Raisin! Maybe one day I can go to Europe and take a few courses on pastry, we will see! Chocolate croissants ready to have with your morning espresso, so delicious!